Michael J. 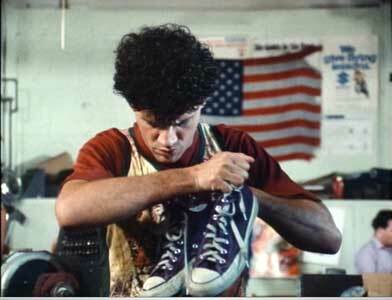 Fox and Tom Villard wear black high top Converse “Chuck Taylor” All Stars in the film. J.J. and Nancy accidentally meet in the halls of Excelsior Union High School. High School USA is a light comedy about rival cliques in a midwestern high school. J.J. Manners (Michael J. Fox) is an average “nice guy” student who runs afoul of the inner circle led by Beau Middleton (Anthony Edwards) because he hits if off with Beau’s girl friend (Nancy McKeon) when they have a few chance encounters. Beau embodies everything you want to hate — wealthy, overbearing, the campus king who uses his family power and influence to manipulate the other students and the school’s faculty. The “A” crowd people who hang out with him follow his orders to the letter, act as his enforcers, and even do his homework for him. He has the faculty sucking up to him because his father has offered a $10,000 prize which will be awarded to one of the school’s teachers for summer study in Europe. Meanwhile, J.J. hangs out with the school nerd crowd, including Otto (Todd Bridges) a genius student with a 200 IQ who has invented a robot, Chucky and Arch (Michael Zorek and Glover Crispin) two losers with no social skills still trying to land a first date, and Bandini (Tom Villard), a guy so out of touch with reality that he does things like put his shoes on the wrong feet then wonder why he has trouble walking. J.J. himself comes from a broken family -- his mom has been gone since second grade, and his dad is never around. But somehow he keeps going on and maintains a cheerful disposition. Bandini has trouble telling his left foot from his right. The only person in either clique who seems normal besides J.J. is Nancy, who seems strangely unimpressed by Beau’s entourage and power, although she does like being in the “A” crowd. The other girls in Beau’s clique are constantly telling her how to behave. (Why is the most obnoxious girl in these movies always a Southern belle type with a thick accent?) Nancy likes to be accepted for the first time in her life, so she continues to go steady with Beau, but as the film progresses, she clearly is starting to fall for J.J. As Beau sees this, he goes ballistic and starts to think of ways to get J.J. in trouble at school and make him look bad. As the pranks go back and forth, J.J. ends up challenging Beau to a car race to once and for all settle things. J.J. thinks that he will have Arch’s father’s brand new sports car to use in the race. But Beau finds out about this ploy and through the efforts of his friends, get Chucky and Arch to total the car. Luckily, at the last minute, J.J. is able to rally his friends into helping him fix up his own car so he can take on Beau. The race and subsequent changes that occur at the school make up the balance of the film. 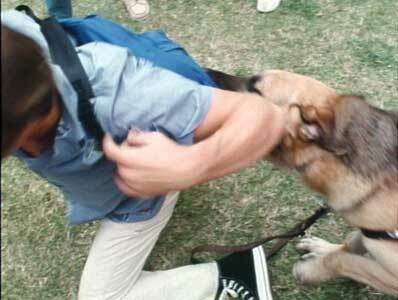 After Beau hides a steak in J.J.’s backpack, J.J. becomes this dog’s best friend. High School USA is one of Michael J. Fox’s first films, and already he is able to deliver that cool everyman presence that served him so well in the Back to the Future films and various television situation comedies he has appeared in since this release. If you are used to Anthony Edwards in his ER role, you will get a kick out of seeing him as a snobby prep. Another interesting feature of the film is its use of childhood stars from the 50s and 60s as the school staff. Tony Dow (Leave It to Beaver) plays the principal, Angela Cartwright and Dwayne Hickman (Make Room for Daddy and Dobie Gillis) play the two teachers having an on again—off again romance, while David Nelson (Ozzie and Harriet) plays the school janitor. Bob Denver makes a brief appearance as Arch’s dad, who just bought the new sports car that gets totalled. It also has some stereotypes like the harried shop teacher and the blind but authoritarian history teacher. The film is a pleasant diversion but really never gets beyond the level of a television situation comedy. 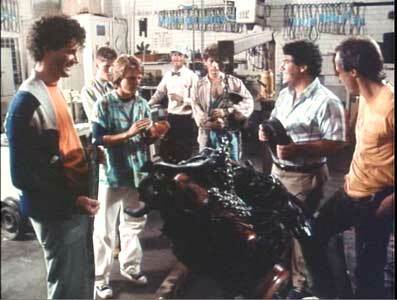 J.J. exhorts his friends to help him fix up his car so he can beat Beau in the race. Nancy and J.J. hit it off for the first time while riding the ferris wheel together. Michael J. Fox wears black high top chucks thoughout most of the movie as does Tom Villard who plays Bandini. 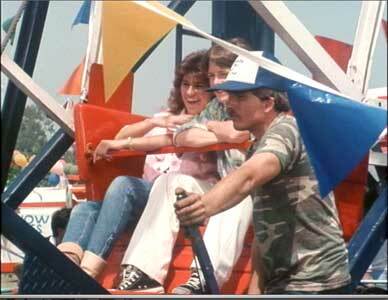 The best chucks scene is where Nancy and J.J. are riding on the ferris wheel at the school carnival. 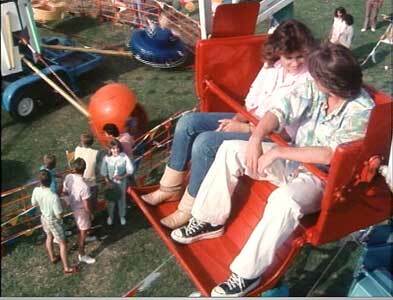 J.J. talks his way onto the ferris wheel so Nancy and he can ride together. High School U.S.A. (1983) Michael J. Fox, Anthony Edwards, Nancy McKeon, Todd Bridges, Lauri Hendler, Dana Plato, Bob Denver, Tony Dow, Angela Cartwright, Dwayne Hickman, Tom Villard, Michael Zorek, Crystal Bernard and Crispin Glover. Directed by Rod Amateau. Categories: Comedy, Teenagers.